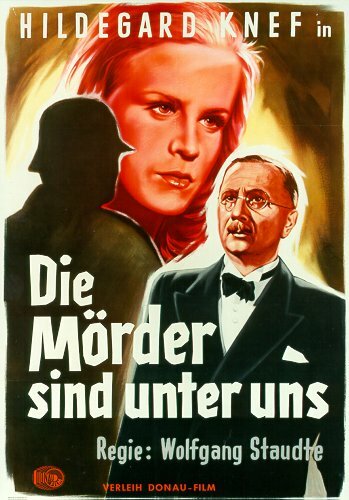 Wolfgang Staudte’s Die Mörder sind unter uns (The Murderers Are Among Us) premiered on October 15, 1946, in the Soviet sector of Berlin (later to be known as East Berlin). It’s an important film, and not just because it was the first film released in Germany after World War II. It was the first attempt by German filmmakers to come to terms with the enormity of the war crimes committed during the Third Reich. It’s occasionally heavy-handed, and it doesn’t really address the specifics of who died in the Holocaust or why, but these things can be forgiven. It’s a powerful, well-made film with uniformly fine performances from its lead actors. Die Mörder sind unter uns was the first “Trümmerfilm” (“rubble film”), which were films that used war-ravaged Berlin as a setting. 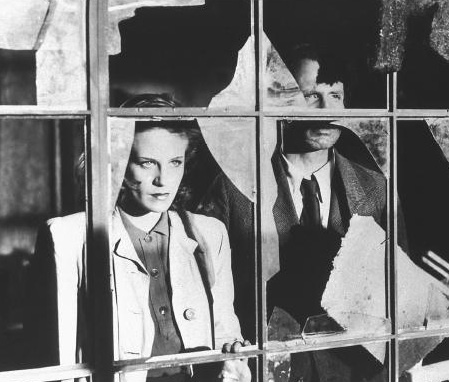 Other Trümmerfilme that followed include Gerhard Lamprecht’s Irgendwo in Berlin (Somewhere in Berlin) (1946), Helmut Käutner’s In jenen Tagen (In Those Days) (1947), Josef von Báky’s … und über uns der Himmel (…And the Sky Above Us) (1947), and Harald Braun’s Zwischen gestern und morgen (Between Yesterday and Tomorrow) (1947). Die Mörder sind unter uns begins with a montage of miserable-looking people slowly making their way through the rubble by train and on foot. Among them is Susanne Wallner (Hildegard Knef), who has just been released from a concentration camp and is going back to the apartment she left in Berlin. A poster featuring a picturesque castle that says “Das schöne Deutschland” (“beautiful Germany”) hangs askew in a bombed-out train station filled with shabby and emaciated people, including one man, hobbling on crutches, with “PW” stenciled in white on the back of his threadbare topcoat. Knef is fresh-faced and beautiful, and an unlikely looking camp survivor. (Looks can be deceiving. In reality, the actress fled Berlin toward the end of the war dressed as a boy to avoid being raped by Soviet soldiers. Her ruse worked, and she was sent to a camp for prisoners of war. Eventually, however, her fellow prisoners helped her escape.) Before the end of the war, Knef had acted in a few minor roles in Nazi productions — most of which were released after the war — but as an actress in the post-war years, Knef didn’t try to hide her past. In fact, the crew of Die Mörder sind unter uns was dominated by veterans of the Nazi film industry. The director, Staudte, was involved with making the infamous antisemitic Nazi propaganda film Jud Süß (1940). To make this film, Staudte worked under the auspices of Deutsche Film (DEFA), which was the only production company licensed to operate in the Soviet Zone, and was formed from the ruins of Universum Film AG (Ufa), which was a powerhouse studio in Germany from the silent era through the downfall of the Third Reich. Early in the film, a kindly old glasses maker named Mondschein (Robert Forsch) tells Susanne, “No, it is easy to forget what happened.” He tells her that she merely needs a goal, and to work. On the one hand, it’s an ironic statement, since the whole movie is about coming to terms with the past, but it’s a statement that holds true for at least one of the main characters, Ferdinand Brückner (Arno Paulsen), a factory owner who recalls “golden days in gray uniforms,” but who now looks to the future. He wants to rebuild his industry and make a lot of money doing it. In one memorable scene, Brückner sits at his breakfast table with a newspaper in front of him with a headline that screams, “2 Millionen Menschen vergast!” (“Two million people gassed”), in reference to Auschwitz. The camera tilts up to Brückner taking a sip of coffee or tea, then putting a piece of toast in his mouth and chewing it like a ruminating cow, his face placid and unconcerned. On the other side of the coin is Dr. Hans Mertens (Ernst Wilhelm Borchert), a man so haunted by the war that he seeks refuge in the bottle but still can’t escape the horrors he carries with him. The film isn’t just about politics. A romance slowly grows between Susanne and Dr. Mertens, budding as he comes to terms with the things he witnessed during the war, culminating in a powerful finale that takes place on Christmas Eve, 1945. He stands outside of the skeletal remains of a cathedral, listening to the congregation singing “Stille Nacht, heilige Nacht” (“Silent Night, Holy Night”) as snow flurries whirl around him. He has a pistol in his pocket, and is determined to make his old captain pay for what he did during the war. Dr. Mertens recalls Christmas Eve, 1942, in Poland, when he watched as 36 men, 54 women, and 31 children were gunned down as a reprisal for a single shot fired at the German soldiers by partisans. It isn’t the enormity of this crime that makes the biggest impact on the viewer, it’s the banality of the order given by the captain, and his total disregard for human life as he stands inside, untroubled by the mass execution that is occurring outside as he leads his officers in a Christmas carol. The film was originally to be called Der Mann den ich töten werde (The Man I Will Kill), and to end with Dr. Mertens exacting justice, but instead the ending was softened, and Susanne convinces him to let the courts dispense justice. Apparently the Soviet authorities who granted the film license were worried that Germans would take the original title and ending as a call for vigilante justice and hunt down the former Nazi war criminals who lived in their midst. Posted in 1946, October 1946 and tagged Albert Johannes, Arno Paulsen, Christian Schwarzwald, Christiane Hanson, Deutsche Film (DEFA), Die Mörder sind unter uns, Eberhard Keindorff, Elly Burgmer, Erna Sellmer, Ernst Roters, Ernst Stahl-Nachbaur, Ernst Wilhelm Borchert, Eugen Klagemann, Foreign Films, Friedl Behn-Grund, Fritz Staudte, German Cinema, Hans Heinrich, Hilde Adolphi, Hildegard Knef, Johanna Sibelius, Käthe Jöken-König, Marlise Ludwig, Michael Günther, Robert Forsch, The Murderers Are Among Us, Ursula Krieg, Wanda Peters, Wolfgang Dohnberg, Wolfgang Staudte, World War II. Bookmark the permalink.